This story of a young, heavy metal rocker whose girlfriend dies and he expresses his grief through his music. This sounds simple, and in many ways it is, but there’s a real beauty to the manner and form in which this tale is told. It’s rather difficult to talk about the art and the story as separate entities because they are truly tied together so intricately here — as a good graphic novel should do — but I’ll try. The art has a sweeping, soft flair which is in contrast to the heavy metal rock lifestyle of the characters. The art is very stylized rather than realistic, which works very well for this story. In many cases, the art is worth looking at even without the story. The story is quite simple, as I’ve already stated. The young man, known as ID (or D?) has a bit of a temper that gets out of hand at times. Getting angry, he uses his guitar as a weapon, swinging it at a crowd, which puts him on a hate list by some local toughs. But for the most part, ID is trying to make sense of the hole in his chest from missing his girlfriend. The only way he knows how to deal with it is to make music, which he does….sending the music to the wind, hoping the wind will carry it out to his girlfriend’s spirit. There is a sub-plot of one of ID’s friends experimenting in a gay relationship. This is handled very well. One of the things that works really well here is the sense of creating a powerful, emotional musicality through words and drawings. It’s a difficult thing to do, but author/artist Tony Sandoval gets it just right. We can practically hear the music come off the page. Combined with the beautiful art, this book really connects and I was drawn in to it much more than I expected. What doesn’t work quite as well as it could, is the beginning few pages of the story. It rambled a bit, neither giving us a good idea of the characters nor setting up the story. I was a little lost at the beginning, which is why I wasn’t expecting to be drawn in to the book. And as much as I liked the art, overall, there were times it didn’t work. In the first sequence of the gay relationship, I had absolutely no idea that one of the characters was male until later in the book. Most of the male characters had long, flowy (rocker) hair, and so it wasn’t at all clear that a figure was male just by appearance alone. Overall, this is a beautiful book and I would gladly look for more volumes. Looking for a good book? 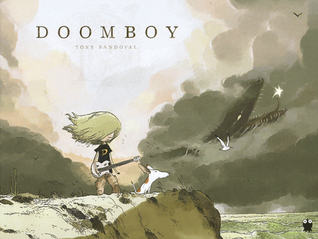 This graphic novel, Doomboy, has a remarkably soft touch for a story of a heavy metal rocker. Beautifully told and illustrated, this is well worth reading!